Meet the Philips Elevation, an ultra-slim LED Smart TV that comes packaged with technology its manufacturer promises will offer a more immersive viewing experience than ever before. 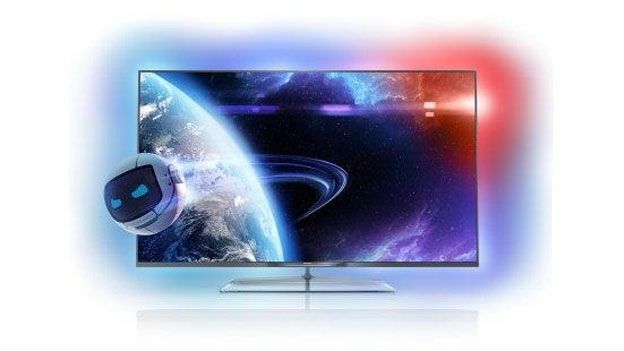 The Elevation is easily the thinnest 3D television set that Philips has ever produced; its 60 inch screen is housed in casing just 13.5mm thick. Philips says the LED screen delivers flicker-free pictures with a 900 HZ Perfect Motion Rate allowing for super smooth picture movement. Smart TV funcionality - catch-up TV, Netflix, internet browser, YouTube, Facebook, Skype and more - as well as smart device connectivity are offered as standard. Elevation also contains 4 HDMI ports, 3 USB ports, Scart, Ethernet LAN, CI+, EasyLink (HDMI-CEC) and is Wi Fi enabled. The big new dra, though, is something Philips are calling the Amblight system. Amblight essentially creates light effects around the Elevation set that correspond to video content playing on the screen. It acts to virtually expand the TV's screen offering a more immersive viewing experience. Philips says that the Amblight effects will work on viewers whether the Elevation is wall-mounted or not. This sort of innovation comes with a pretty hefty price tag, however. The Elevation will cost consumers £2,800 when it goes on sale in the UK in the third quarter of this year.